When we look at the basic mechanism of how it works, we are enhancing the microcirculation. We are getting more red blood cells flowing to the area. But it’s not just the arterial blood supply to the area; we are enhancing the venous and the lymphatic return from the area. We’re also increasing oxygenation of those tissues. We are stimulating the hemoglobin molecule to dump off oxygen at the treatment site, so we are increasing the oxygenation of those tissues. By stimulating the cytochrome oxidase enzyme, we are utilizing that oxygen in the respiratory chain inside of the mitochondria, producing more ATP for that cell. So regardless of what kind of cell it is, it’s going to function at a higher level. Now, we are not turbocharging. We’re not making your body do anything that it could not normally do. We’re just facilitating the process. We are helping those cells produce the energy that they normally would, so they can function as they normally should. 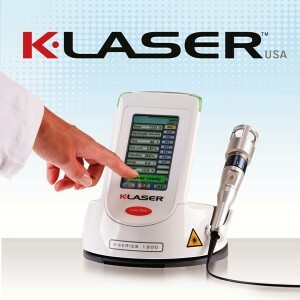 The interaction that we’re getting in the body with the K-Laser is called a photochemical reaction. By shining that light on a tissue, we are getting that ATP energy produced. You can have the best diet and exercise program in the world, but as most of us are painfully aware, it doesn’t take much to develop an injury from an accident that you were not responsible for. Many times, surgery will be recommended to repair or replace joints. There are certainly many times when surgery is appropriate and needs to be performed and we should be VERY grateful we have access to this tool, but more often than not it is inappropriately recommended because of lack of awareness of other effective options, including the healing power of lasers. When we talk a little bit about how the laser works, one effect that we’re getting is vasodilation of the tissues and also a lot of release of the tissue irritants in the area. If we’re treating a patient that has a lot of myofascial trigger points, a lot of metabolic waste products, and we give them a K-Laser treatment, a couple of hours afterwards they might be a little bit sore. It’s absolutely not any tissue damage going on; it’s because we’re causing the release of all of those metabolic waste products that were locked up in the muscle… Just [drink] a little bit of extra water to help flush that out. • Laser therapy is also used by some veterinarians to treat arthritic conditions, hip dysplasia, or intervertebral disc disease in dachshunds, for example. • By shining that brighter light at the surface, photons of light are able to penetrate deeper into the tissues, which allows you to treat deep-seated pain conditions.